We credit Steven Blier and the New York Festival of Song for expanding our appreciation of art song beyond those of the 19th c. sung in German. We credit Mirror Visions Ensemble for further opening our ears to new experiences. MVE has been around for a quarter century, exploring the connections between music and text with their original thematic programs, designed to appeal to a wide audience. One gets to hear songs both old and new, familiar and novel. Often one gets to hear the same text as set by different composers--always a fascinating excursion. 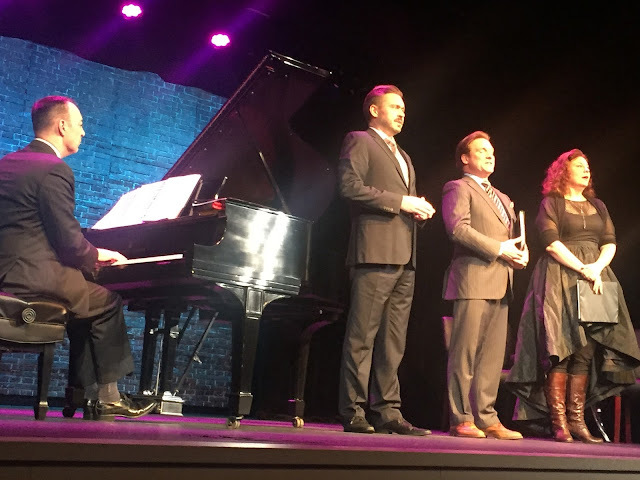 The weather outside was frightful, as they say, but inside the cozy theater of the Sheen Center, we were gifted with glorious music, interpreted by soprano Vira Slywotzky, tenor Scott Murphree, and baritone Mischa Bouvier, accompanied by collaborative pianist Grant Wenaus. Since Christmas involves the exchange of gifts, one could say that the devoted audience showered the artists with eqivalent applause and cheers. It was a win-win evening. The theme of the evening came from the Bard himself--specifically from Love's Labours Lost-- "When Icicles Hang by the Wall". Roger Quilter gave the verses a straightforward and lively setting (sung by Mr. Murphree and Mr. Bouvier), whereas Richard Lalli's setting, for which Ms. Slywotzky joined in, was made interesting by overlapping voices which produced some interesting effects. Later in the program, we heard two more settings, one by E.J. Moeran sung by Ms. Slywotzky and another one by Christopher Berg (who was present in the audience for the premiere of this work) with complex a capella singing by all three artists generating a lot of complexity. By this time we thought we'd heard enough about "greasy Joan"! The rest of the program offered a great variety of languages from German to French to Norwegian to Swedish to Ukrainian to Spanish and to Latin. Various moods were struck from playful to sacred. But of all of these, there were a few that stick in our ear and our memory. In 1915, Claude Debussy wrote his own text and set it--an anti-war message if ever we heard one. Entitled "Noel des enfants qui n'ont plus de maisons"--the outcry of French children against the Germans; they beg Father Christmas not to visit German homes. This song reminds us of how children all over the world are deprived of their homes and their parents and their feeling of safety by political aggression and misguided "religious" crusades. The French children of the song express compassion for the children of Poland and Belgium and Serbia as well. The song is a masterpiece and was beautifully performed by Mr. Murphree. At the other end of the emotional spectrum was "Twelve Days to Christmas" from She Loves Me by Jerry Bock and Sheldon Harnick, performed in true ensemble fashion by all three singers. Just as the Debussy brought tears to our eyes, this delightful ditty brought laughter to our lips by contrasting the well organized early shopper with the frazzled last minute shopper. Now how much fun was that! The third song that caught our ear was Mykola Leontovych's "Shchedryk" with its insistent motif, sung in perfect Ukrainian (so said our Ukrainian companion) by Ms.Slywotzky and the two gentlemen. Ms. Slywotzky's dramatic skills layered onto her powerful voice added to the pleasures of Joaquin Rodrigo's "Coplillas de Belen". A true curiosity and a highly interesting one is "The Huron Carol", written by St. Jean de Brebeuf, a Jesuit priest who spent a large part of his life in Quebec trying to convert the Huron to Catholicism. He learned the language and added to mankind's knowledge of this tribe but failed to win many converts. This song was written in 1642 and became Canada's first Christmas song. It fascinated us because the composer attempted to make the text relevant to the Huron. Baby Jesus is wrapped in a rabbit skin and is visited by chiefs instead of the Three Wise Men; the gifts are pelts of fox and beaver, instead of gold, frankincense, and myrrh. We enjoyed Mr. Bouvier's performance of "Nun wandre, Maria" in which Hugo Wolf's gorgeous writing for piano was given an excellent performance by Mr. Wenaus. The piano part of Benjamin Britten's "Hodie Christus natus est" was most compelling. One final curiosity captured our attention--"Six White Boomers", a song about Santa's Australian run written by Rolf Harris and John D. Brown. With such a varied program, there was something for everyone; no one left this recital disappointed!